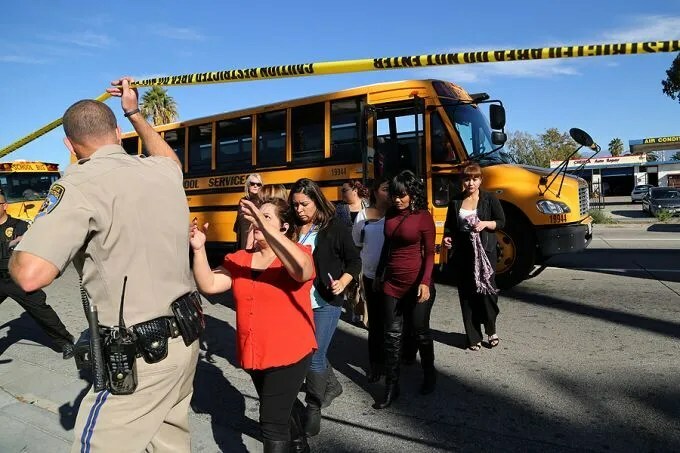 Employees from social agency in San Bernardino being evacuated during shooting spree. Image from Catholic News Agency. I’ve avoided this topic for awhile, hoping I wouldn’t have to keep writing about it. But then this… Thing happened in California, the same day as a similar thing happened in Savannah, Georgia. And now I’m stuck. If you’ve read my articles about Dylann Roof, James Holmes, Adam Lanza and the host of other American mass murderers armed with assault rifles who’ve made themselves known to mass media over the past three years, you kinda know my sentiments on this issue. I’ve also blogged about the contradictions inherent in the Second Amendment. I should also make clear that I have zero respect for the whole ‘founding fathers giving us guns to protect our freedoms’ bromide. Remember that those freedom-loving founding fathers didn’t let all white men without property even VOTE until about 1850, never mind women or free Black men. The Second Amendment was written to put down rebellions (especially slave rebellions), not enable them. And one could argue that the preservation of slavery was part of the rationale for letting non-propertied white men have guns in the first place–especially after the Whiskey Rebellion. That said, I have never bought into the ‘guns preserve our freedom’ argument. In the past 15 years, I’ve seen a national election stolen, the evisceration of the Fourth Amendment, the passage of the NDAA’s imprisonment-without-trial provisions, and Americans being beaten and arrested for exercising their First Amendment rights. Gun owners, you haven’t been protecting ANYBODY’S rights over the past fifteen years. Besides your guns, do you HAVE any rights now that the state can collect your information without a warrant? 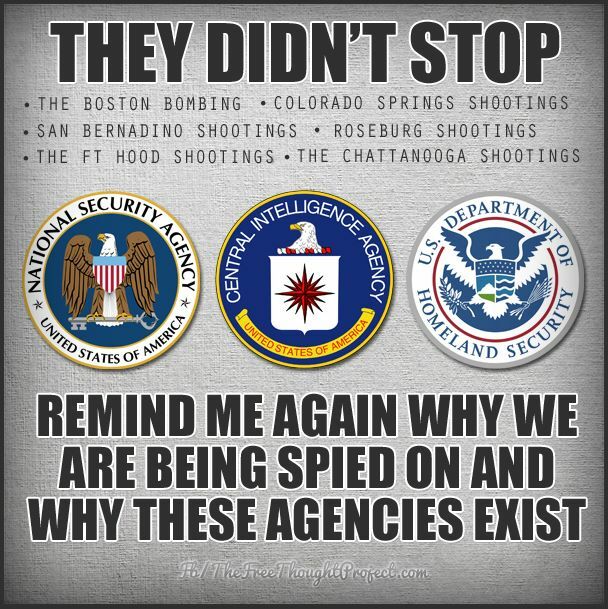 These guys can’t stop terrorist attacks but they do get to collect all your private information and metadata–wtf? But that’s off the subject. The subject is how to stop these mass shootings that keep occurring in the US at a rate of more than one per day. An acquaintance on Facebook named Jeremy Gable put together an amazing list of all the mass shootings and mayhem of the past year. He separates people killed, people wounded–It’s like a wartime accounting. Scroll through it. Be appalled. But being appalled won’t change things. And there’s a compelling case that, like a lot of other arguments in the US, this one has nothing to do with logic and everything to do with emotion. As pointed out in this article on Vox dot Com, the ownership of a firearm may be the last point of control for aggrieved Americans, including the die-hard gun believers: Let us imagine, then, a conservative gun owner — an older white gentleman, let’s say, in his 50s, living in the Rust Belt somewhere. When he was growing up, there was living memory of a familiar order: men working in honorable trade or manufacturing jobs, women tending home and children, Sundays at church, hard work yielding a steady rise up the ladder to a well-earned house, yard, and car… To our gun owner, another mass shooting is not an argument for getting rid of guns. It’s a confirmation of his every instinct, another sign of moral and societal decay, another reason to arm himself and defend what he’s got left. And in this article, the proposal that would almost certainly bring our gun problem under control is put forward. It would reduce the US to the level of gun violence of, say, the United Kingdom, which had 146 gun deaths IN THE WHOLE COUNTRY in 2011 and (percentage-wise) had 98% fewer gun deaths than the US. Confiscation of guns would do it. It worked in Australia. But wholesale gun confiscation will never happen here. You’d need to not only put the NRA out of business somehow, you’d need to ban corporate money from elections (gun manufacturers thrive on threats to gun ownership–sales go up). You’d have to get an American national consensus that probably hasn’t been around since Pearl Harbor. None of these close votes that can be killed by cloture–such a bill would need 70% approval rating and at least 300 House votes. If the one thing proven to work can’t be done, what else will work? Or what won’t work? One thing that doesn’t work is passing strict legislation in states like California and New York. I’m very happy to know that buying a handgun in NYC is damn nigh impossible, but unless you erect custom-style border agent buildings and set up search teams to search cars for guns at all the Port Authority crossings, the handguns will keep coming up from Virginia and other lax-gun-regulation states on the I-95 corridor. And by definition the majority of those guns will be coming in for illegal purposes. Dear liberal Dems–please stop pretending you’re doing something by passing STATE laws. On the federal level, we might designate membership in a state-recognized militia as being a requirement for gun ownership. That’s what the founder’s language is (after all). It could be an informal thing–if you’re in the gun owners’ militia, you just have to show up twice a year at a ‘drill site’, answer some questions on a multiple choice test, and you’re good to go. Slightly more onerous than what we require for a drivers’ license, but less draconian than confiscation. What if the answer is ‘Nothing’? What if the status quo and the DC gridlock means that nothing can be done to stop slaughter? The GOP (with some assistance from elected Democrats from gun-friendly states) have blocked or circumvented any reasonable chance of stopping mass killings or even getting us down to a number of gun deaths below five figures. And it’s annoying and disingenuous for elected Democrats to pretend that they can make any dent in the scourge of mass killings without some cooperation from the other party in our duopoly. And (back to the Vox article), maybe nothing CAN be done about guns without addressing the context of poor angry men, declining opportunities and the grinding sense of loss so many in this country feel at the moment. As I’ve pointed out before here, the US is not in recovery or in a slow motion recession. We are in a structural depression, unlike anything we’ve seen since the 1930’s. Those angry men are striking out as loners at present. What happens if they start to organize?